Pours a nearly opaque black with a thin dusting of tan head. The aroma is rich coffee, dark chocolate, and peanut butter. Mild carbonation, and a full rich mouthfeel make this a wonderful sipping beer. The chocolate and peanut butter pair up with the coffee and roasted notes in the porter amazingly. It's great news that this is finally getting distributed (at least in a limited manner until the production facility is on line). Pours black with a finger of khaki foam. Poured out of a 32oz crowler canned 5 days before consumption. Head formation is fair, with fair retention. Aroma is peanut butter from the moment the crowler was cracked open. 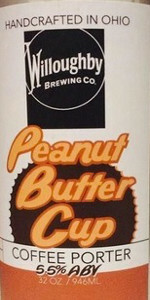 Peanut butter is accompanied by a bold note of medium-roast coffee, and finer notes of milk chocolate and toast. Flavor profile is peanut butter forward, both when the beer is cold and warm. Coffee is present, and carries a wonderful medium-roast, medium-body. Milk chocolate, toast, and a hint of lactose give the beer a little extra dimension, but overall the focus here is peanut butter and coffee. Mouth feel is medium in thickness with a texture that is stuck somewhere between fizzy and velvety. While it's a smooth and favorable texture, its fizzy nature keeps it from being completely smooth. Overall, a wonderful porter that nails every flavor its name implies, all the while retaining a splendid balance. Served in a 12oz snifter from a 32oz crowler. My first from this brewery. 9 days on this brew. Poured into a Squatters true pint glass a pretty nice dark brown color, pretty nice carbonation, with a pretty nice thick/creamy one-finger plus light tan head, which leaves some nice sticky lacing behind. The nose is malty, with some pretty nice chocolate/toffee notes, peanut butter, vanilla, nice touch of coffee, nice little roasty/nutty note. The taste is really nice, malty, chocolate/toffee, vanilla, nice sweetness, peanut butter, really nice touch of coffee, roasty/nutty. Medium body, ABV hidden very well, nice dry/bitter finish. Overall, a really nice tasty brew. Glad to have gotten a chance to try it. Awesome beer. It's not Nut Smasher, but at 5.5%, it's a tasty coffee peanut butter porter. Body is lighter-medium, with a nice balance of coffee flavour and peanut butter sweetness. The porter doesn't contribute much, but on the flavour, it's got a nice Reese's peanut butter cup flavour to round things out.